I know it’s a bit late in the year for a Halloween post but part of this project can really be made any time of the year. I’ve always enjoyed making my kids Halloween costumes, either from a pattern or from stuff around the house so this year wasn’t going to be any different. I just find the store bought costumes not warm enough for a chilly October evening and they are also way more expensive! Why pay $20-$30 for something I can make at home for under $10 and also enjoy doing!? I will admit, I did buy last year’s pumpkin costume but I cut it up and put some Velcro on it so accommodate for the baby Bjorn so that I could carry him around. Onto this year, my son loves this stuffed sock monkey over at his Grandma’s house and I wanted to surprise her this year by making him into one too! I started looking around on Pinterest for DIY Sock Monkey costumes and figured the best way to do this would be to make him a little suit out of an old sweater. So the hunt began. I searched all over the Men’s and Women’s sections at Value Village but couldn’t find anything even close to what I was looking for. Just when I was about to leave I was walking through the pajama section and there it was. The PERFECT sweater just sitting on it’s own in the wrong place! I couldn’t believe my luck.. and it was only $5.99! Long story short, this was the beginning of my crochet addiction. I researched sock monkey hat patterns to death and found a few videos to help me learn how to crochet before I took on the project and needless to say, I eventually learned how. 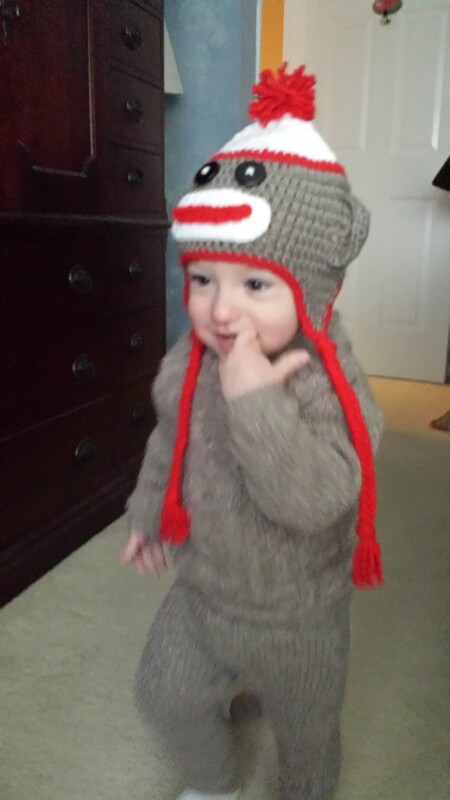 The sock monkey hat is from Repeat Crafter Me (of course) because I love that blog. Here’s the little sock monkey himself, and like a true monkey, it’s impossible to get him to stay still or pose for a picture. Here is the hat all on it’s own. Check out more crochet hats here!